What is the Weather and Climate of Antarctica? situation in terms of weather and climate. weather, climate, and seasonal change. 2-Rays from the sun range from direct to indirect. A-Direct rays strike the surface of the Earth at close to a 90 degree angle. rays are more spread out. The spread out rays provide less heat. South Pole has 24 hours of darkness lasting about six months. daylight, it stays cool because the sun's rays are so indirect. F.  to 59 degrees F.  on the coast, and 5 degrees F.  to -41 degrees F.
the summer months. The mid-winter temperatures range from -40 degrees F.
to 31 degrees F.  on the coast and -126 degrees F.  to -21 degrees F.
during late August before the return of the sun. absorbed by the water vapor in the atmosphere. -Antarctica has a higher elevation which causes cooler temperatures. to change temperatures as compared to the land. wind and average about 11 miles per hour about 64% of the time. topography, distance from large bodies of water, and nearby ocean currents. also shorter periods of darkness in the winter. to the water's heat storing capability. interior has a very high altitude which adds to the very cold temperatures. ocean, it gets no warming effect from the water. Antarctica is a very harsh place. 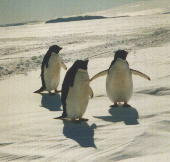 compare the climates of Antarctica with the climate in which they live. 1-The student will know where Antarctica is located. different seasons for both the Northern and Southern Hemispheres. or 24 hours of darkness during the year. 6-The student will define weather. 8-The student will understand the conditions which cause wind. 11-The student will define climate. pencils, Construction paper, Rulers, library resources. 1-Describe what the weather is like at the South Pole (Antarctica). Include such things as temperature, wind, rain, or snow. each (i.e., 2 pairs of socks). 3-Explain why Antarctica is colder or warmer than where you live. 4-Describe in 3 or 4 sentences the difference between climate and weather. activities you would like to do in that climate. weather and climate, show the materials to the class. questions on the Antarctica Weather and Climate Worksheet. 1-What is the driving force for weather on the Earth? 2-Explain why direct rays produce more heat than indirect rays? 4-List some factors which cause Antarctica to be so cold. 5-Why is there so little precipitation in Antarctica? 6-Fill in the following table of weather conditions. 7-What is climate? What are the two main features of climate? 8-What factors influence the climate of Antarctica? 9. Which of the two Antarctic climates would you choose to live in? Explain what conditions there are that would want you to live there. Explain what kind of outdoor activities you could do in that climate. and what they would do for employment and recreation in that environment. They will then compare their perfect climate with Antarctica's climate. is a major factor determining whether or not the trek can be finished. the data table for their week of the Expedition. 3-After the table is finished, the team should write a summary of the week. -Average temperature of the week. -Range of wind speed for the week. -Average wind speed of the week. -Other weather conditions encountered during the week. -Distance covered during the week. -Any other difficulties caused by weather during the week. -Meet in small groups of 8-10 to share summaries. -Share the summaries orally in front of the whole class. -Did the weather improve as they got further along in their trip? that we are encountering during the same time? -How do you think you could manage to survive in the weather of Antarctica? altitude and the fact that the Earth is tilted in its orbit around the sun. determine what factors influence each climate. given in the climate data table. 2-Plot the climate data for the five locations on each of the five graphs. represents and label each graph with the name of the appropriate city. your reasons for deciding which location goes with each graph. 3-Which graph shows the greatest temperature range? -What factor would explain this? 4-Which graph shows the smallest temperature range? 5-What are the differences in climate between the two Antarctica locations? 6-Explain the difference in climate between the two Antarctica locations? each location during the summer and winter. prefer to live in? Explain why? prefer to go to on vacation? Explain why? want to visit? Explain why? ORDER TO DEAL WITH CLIMATE? brochure will be designed on an 8 1/2" x 11" piece of paper. -Average weather expected in Antarctica each season. -Activities that people could do in Antarctica. -Drawings showing where Antarctica is located. -Drawing or pictures showing what people can see in Antarctica. -Clothing that people should bring to wear in Antarctica. -Anything else that you feel would be important to add. Your completed brochure is due on (DATE). a. 10 degrees C. to  90 degrees C.
b. -20 degrees C. to -30 degrees C.
c. -10 degrees C. to -75 degrees C.
d. -50 degrees C. to  10 degrees C.
a. There would not be any seasons. 4-During which season is there 24 hours of daylight in Antarctica? 5-During which season is there 24 hours of night in Antarctica? 1-Antarctica is warmer than the Arctic. 2-The interior of Antarctica receives over 8 feet of snow each year. 3-Wind chill has no effect on travelers in Antarctica. 4-The ice in Antarctica doubles in size during the winter. 5-Blizzards in Antarctica occur only while snow is falling. 1-List and explain the factors which cause the Earth's seasons. 2-Explain why direct rays are warmer than indirect rays. -Label the season that each Earth is on. -Label the date when the Earth will be in that position. 4-What factors cause Antarctica to be so cold? 5-What causes the wind to blow? 6-What are two special conditions caused by the wind in Antarctica? 7-How is the climate of Antarctica different from where you live?